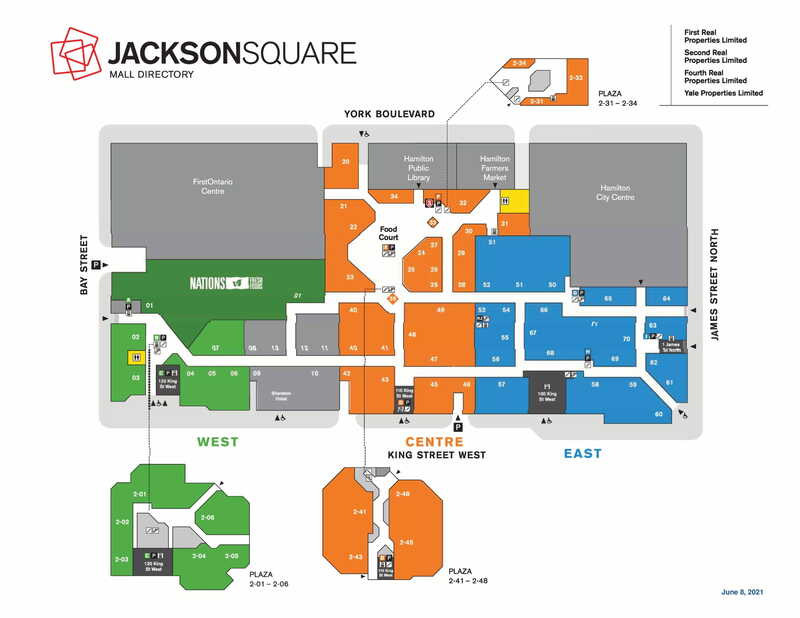 Jackson Square offer more than 125 brand name stores. Jackson Square is located in Hamilton, Ontario - 2 King Street West, Hamilton, Ontario, ON L8P 1A1, Canada (GPS: 43.257222, -79.870119). Look at the list of stores in Jackson Square , hours, location and information about mall and special events, sales, coupons. You can choose store from list below and get detail information - other stores locations for the brand, location, shopping hours, phone, map, directions contact. Jackson Square is one of the best shopping place for spend your free time - mall/shopping center has all types of stores - outlets, department, fashion, traditional and more. Have you ever visited Jackson Square ? Do not forget to write shopping review and rate your satisfaction. Jackson Square, also known as Lloyd D. Jackson Square, is an indoor, one-level shopping centre and commercial complex located in the downtown of Hamilton, Ontario Canada. The part of commercial complex is included: four office towers, Sheraton hotel, Copps Coliseum, Hamilton Farmer’s Market, Hamilton City Centre, the Hamilton Convention Centre and the Hamilton library. The mall is named after Lloyd Douglas Jackson who served as mayor of the city. Jackson is expanded along two blocks of King Street, the first one is James and the second one is Bay Street. The approximately large of retail area is 390 000 square feet. Jackson Square was officially opened in 1970. The mall is owned by First Real Properties Limited and Fourth Real Properties Limited. The companies were founded in the 1970s and the 1980s to develop real estate in Canada and currently they own over four million square feet of property in Calgary, Toronto and Hamilton. The management of the Jackosn Square is Yale Properties Limited. There are over 230 stores and underground parking for up to 1 300 vehicles. You can pick from these interesting brands, for example: Chanchal Parfumes, Bentley, Payless ShoeSource, Dollarama, Bell World, Fido, Ardene, Anna Bella, Suzy Shier, Sirens, Shoe Corner, Sunglass Stop, LCBO, La Galleria Canada, WirelessWave, HT Jewellery, Mike’s Jewellery, Golden Gate Jewellery, 1001 Nights, Bluenotes, Urban Planet, Me Boutique and more. Serverces are represented by: Bank of Montreal, Goodlife Fitness, Landmark Cinemas, Angel Beauty Bar, Denninger’s Foods of the World, Nails for you, Total Image Salon & Spa and so on. For refreshment or dinning you can visit: Burger King, Kentucky Fried Chicken, Starbucks Coffee, Wok Express, Anchor Bar, Oak Café, Crack Me Up, Toby’s Goodeats and more. Jackson Square - Hamilton Area, Ontario ON L8P 1A1. Click on the button and get directions to Jackson Square . Mall/Shopping center is also displayed on the map with gps for your navigation. (1/5) Bring greenery into Jackson Square Mall! I moved from Toronto summer of 2015 & noticed your mall could use real large planters with real large plants!! Please give more life to your mall! It's very blend & dull walking inside the mall! People like to see greenery when walking inside a indoor mall! For heaven sakes buy large planters & real large plants for oxygen when people are there walking around the mall! The Food court could also use around some greenery! The Food Court ceiling is dark grey & depressing! Gee get more bright colours inside the mall! It's a mall with live people bringing businesses into the mall!!! Not a Funeral Complex! If you do it right people will come & happy to shop in the mall! I go there & out as soon as I finish what I went there for! & go to Hamilton City Center cause it has a higher ceiling & real large planters & real large plants for oxygen! For a woman coming from Toronto. Expecting a downtown Mall to be a experience similar to a Yorkdale or Sheridan mall . I wouldn't say Eaton Centre, but, it would bring more people to the downtown area. Bring the downtown area more upgraded and more individual stores people prefer today. Give us your experience with Jackson Square by writing a short review.